The rigid body properties can be used to validate a finite element model, for substructuring or motion analysis. The Ft-RBPE is installed and used as an add-on to the FEMtools Framework or any other FEMtools configuration. The Rigid Body Property Extractor module is a tool for identifying the rigid body mass properties (mass, center of gravity and inertia) of a structure using accelerance (acceleration/force) frequency response functions (FRF) obtained from measurement. The determination of rigid body properties is performed in 2 steps. First, the rigid body responses (called "mass lines") are be extracted from the FRFs. The mass line corresponds to the value of the flat part of the response located between the low-frequency suspension modes and the elastic modes. These values are obtained by using a least squares fit of a low order polynomial (e.g. quadratic approximation). Once the mass line values are known, then the rigid body mass properties are obtained in the second step by solving a set of algebraic equations. Experimental data are imported from a Universal File (UF) or other. A translator for UF is standard included in the FEMtools Framework. If the FRFs are provided in another format, a custom translator can be written in FEMtools Script language. FRFs must be acceleration/force and obtained from a free/free test. Minimum 3 excitation points (one per axis) and 6 accelerometers, resulting in 18 FRFs (3 x 6). The excitation and accelerometer positions (x, y, z coordinates) must be known. An optional wireframe mesh may also be provided for visualization purposes. Uncertainty on the obtained results is function of uncertainty in pickup positions, uncertainty in the excitation direction (especially with an impact hammer), calibration and acquisition chain errors, influence of suspension and/or elastic modes. 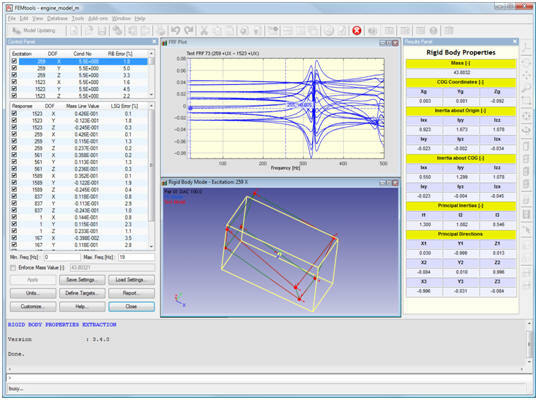 A graphical tool is provided to allow the user to display the FRFs, define a frequency interval between the suspension modes and elastic modes, and extract the mass line values. The rigid body properties are reported in tabular form or exported to file. Option to compute COG and inertias using an imposed mass value. Full control for including/excluding excitation and response DOF. Definition of excitation and response DOF in local coordinate systems if necessary. Interactive definition/modification of frequency interval used for mass line identification. Automatic selection of interpolation scheme for identification of mass line values. Error estimation parameters for rigid body responses and mass line values. Animation of rigid body responses (measured and least-squares). Visualization of COG and inertias using equivalent homogeneous brick. Export of identified rigid-body mass properties to a formatted text file. Automatic definition of the identified rigid-body mass properties as target for model updating. Unlimited customization using FEMtools Script. Automated model updating using rigid body properties as reference target. Reduce components to lumped masses for model substructuring in structural dynamics simulations or motion analysis. Generation of rigid body modes for modal-based synthesis. Easy to Use - A single control window is used for all settings, data visualization and table with results. Cost Effective - Using the same equipment for experimental modal analysis, FRFs are inexpensive to obain compared to traditional experimental methods that use dedicate machinery to identify CoG and MoI. Robust Solutions - Rigid body properties are obtained from a (redundant) set of FRFs using curve fitting and straightforward equation solving. Assess the uncertainty of the results using error estimators. The FEMtools RBPE add-on requires a separate license that is used together with a license for any FEMtools standard configuration. The FEMtools RBPE User Interface.